There are many good books out there on sharpening and many tools out there, but when building a bamboo rod, a sharp plane blade that can shave the hair off your arm is necessary, for a good rod. So over this (and the next blogs? ), I am going to post some notes on sharpening based on lesson that I have learnt. Lets start with jigs and honing guides. I have used several amd here are my thoughts. 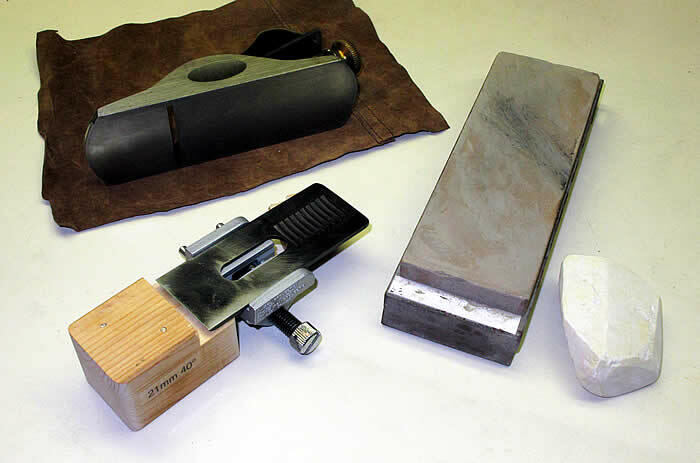 The standard vise honing guide as illustrated above is my goto guide. Pro: Keeps iron square and with a simple homemade block, I am able to quickly able to get a repeatable. Also in-expensive. Con: Roller wheel (under) is narrow and subject to rocking. I have considered (in my sleep) about finding a larger roller and adapting the tool for the wider blades that I use. All guides need care in handling and with application of power. The Richard Kell Honing Guide, a beautiful tool and very stable, but best for low angles or short blades. Pro: Solid tool that will provide you a nice square edge. Con: The stability comes with the use of 2 low mounted guides to the sides of the blade. In doing so, there are a couple of inherit cons > 1) With the mount so low, putting in a steep angle the assembly becomes very top heavy and increases the complexity of holding. 2) Ensure your stones are wide or sharpened on glass-paper given the increase width of the assembly. Pro: Can do a nice micro-bevel. Con: Roller wears too easy (replaced 2), setting and maintaining a square blade is difficult with no guides and a screw down clamp; though the angle jig has presets in-place it is not simple to use and ensure a repeatable angle (replace with home jig). The update guide from Lee Valley, the MK II , which I have not used, includes a jig attachment for angles and what appears to be a bar to secure the blade. Appears to be real improvements over the previous noted guide, but I have not used it.